Hey Soulsters! I had such a wonderful time this weekend connecting with fellow music lovers at Moods Music in Atlanta, GA in celebration of National Record Store Day. I wrote about this event last year (see here) and it has become the event that I look forward to the most. Not only do you get to hear and discover talented independent music artists, but you also get to support your local record store and give back to them what they have put into the community. Moods Music owner, Darryl Harris is definitely loved by the community and his love of music and people permeates the walls of his store. Everyone that attended was there in high spirits and the vibe was filled with so much love. 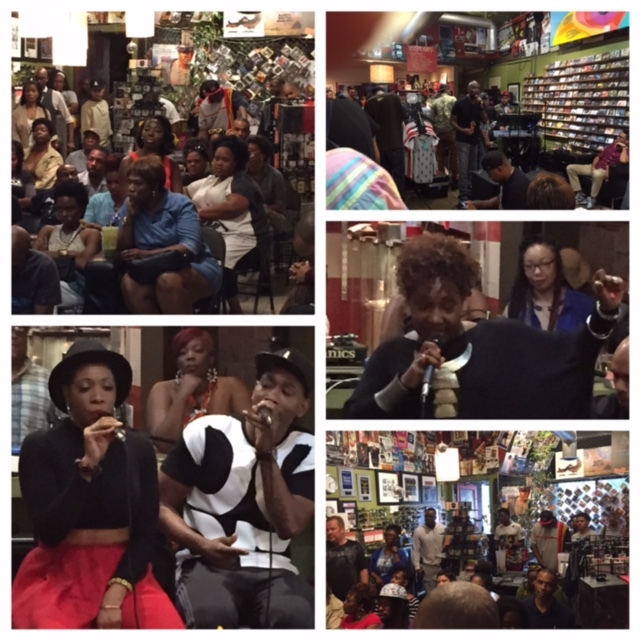 We were all there to support the store, the music and the artists. That is what it is all about, people. Can you tell I had a great time? Zo! will be performing at Vinyl in Atlanta on this Saturday, August 10th. You certainly don’t want to miss his show. Part of the Foreign Exchange family be ready to have his music lift you up and have you feelin’ good! He will be performing tracks from his latest release, ManMade as well as from his previous offerings, of course. He also has so many collabs with some of our favorite underground soul artists (Anthony David, Phonte, Yahzarah, Erro) that you never know who will drop by! Don’t let the Atlanta rain deter you from enjoying the “Sun Storm” that will take place at Vinyl Saturday night.